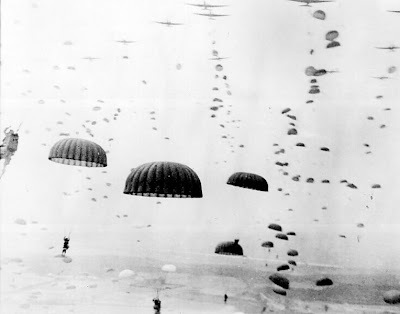 Welcome back to the ongoing campaign for Arnhem! Over the last two weekends, I've been posting my progress on the Nations at War five-scenario campaign that takes place in September 1944 during Operation Market Garden. In the last two scenarios, the British had taken Arnhem and defended the city against a vicious counter-attack that came pretty close to eliminating the British 7th Paras. 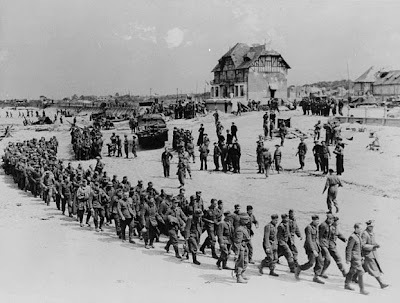 On September 19th, 1944, the British have to clear the road for reinforcements and supplies to arrive in the city. We can't spend our refit points (RPs) in this scenario as I guess we're dealing with a different group of Paras. However, the British paratroops in this scenario can earn more refit points for use in the next scenario. The Germans losses from this scenario will also carry over into the next one. Last weekend, I started "The Arnhem Campaign", a five-scenario campaign for Lock 'n Load's WW2 Platoon Combat game, "Nations at War". In my first outing as the British, I'm not sure how well I fared as my HQ had been reduced and my recon jeeps were scrap metal even though the British 7th Paras had successfully captured Arnhem and its sole bridge (P05 hex). The Germans had inflicted enough damage on my units that I was forced to spend all of my refit points (RPs) to get back up to full strength. No new toys for me. Well, this weekend is the second scenario from the campaign and it features the German counter-attack on Arnhem. The British have to face two German units, the Aufklarung Abteilung 4 and SS Dauer. Along with my refitted units, I end up getting a 3 inch mortar and another platoon of paratroopers. I've sure got a lot of infantry! In Lock 'n Load's "Line of Fire" magazine issue 10, there's a 5-scenario campaign for the WW2 platoon-level combat game, "Nations at War". The campaign features scenarios based around the unsuccessful Allied attempt to liberate the Netherlands in September 1944 known as Operation Market Garden. The first scenario in the campaign is based on British Major-General Urquhart's attempt to capture Arnhem and the bridge that linked both sides of the town. The British player gets command of a handful of paras and a recon jeep, which is a new counter for the Brits to use and is included with this issue. The Germans get only a tiny contingent of men (one full platoon and a reduced platoon) to defend Arnhem with reinforcements from a recon vehicle unit coming in later. Fortunately for the Germans, there is only one bridge in the city (the other two bridges on the map are ignored), which makes it easy for them to decide where to make a stand. About eight years ago, I was lucky enough to tour the Normandy invasion beaches and it was an incredible experience. Remnants from the war dotted the beaches along with various memorials and souvenir shops, etc. After visiting the Omaha landing site, I struck out on my own and decided to walk the length of the beaches to the east. I trudged along the shore through Gold and on to Juno. It took all day and you don't really realize how crazy the whole affair must have been until you see for yourself just how much open ground there is between the water and the nearest berm or hill. As a Canadian, I'm quite proud of what our soldiers did and the enormity of what it said about us as people determined to do what is right in the face of so much wrong.